(Phys.org) —Acquired by ESA's Planck space telescope, the most detailed map ever created of the cosmic microwave background – the relic radiation from the Big Bang – was released today revealing the existence of features that challenge the foundations of our current understanding of the Universe. 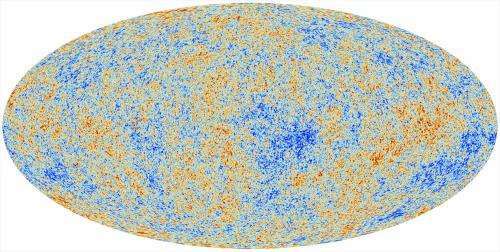 The image is based on the initial 15.5 months of data from Planck and is the mission's first all-sky picture of the oldest light in our Universe, imprinted on the sky when it was just 380 000 years old. This 'cosmic microwave background' – CMB – shows tiny temperature fluctuations that correspond to regions of slightly different densities at very early times, representing the seeds of all future structure: the stars and galaxies of today. Planck was designed to map these fluctuations across the whole sky with greater resolution and sensitivity than ever before. 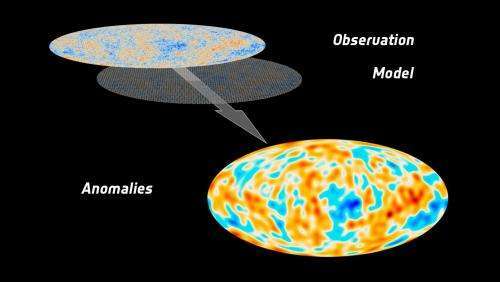 By analysing the nature and distribution of the seeds in Planck's CMB image, we can determine the composition and evolution of the Universe from its birth to the present day. Overall, the information extracted from Planck's new map provides an excellent confirmation of the standard model of cosmology at an unprecedented accuracy, setting a new benchmark in our manifest of the contents of the Universe. But because precision of Planck's map is so high, it also made it possible to reveal some peculiar unexplained features that may well require new physics to be understood. "The extraordinary quality of Planck's portrait of the infant Universe allows us to peel back its layers to the very foundations, revealing that our blueprint of the cosmos is far from complete. Such discoveries were made possible by the unique technologies developed for that purpose by European industry," says Jean-Jacques Dordain, ESA's Director General. "Since the release of Planck's first all-sky image in 2010, we have been carefully extracting and analysing all of the foreground emissions that lie between us and the Universe's first light, revealing the cosmic microwave background in the greatest detail yet," adds George Efstathiou of the University of Cambridge, UK. The asymmetry and the cold spot had already been hinted at with Planck's predecessor, NASA's WMAP mission, but were largely ignored because of lingering doubts about their cosmic origin. "The fact that Planck has made such a significant detection of these anomalies erases any doubts about their reality; it can no longer be said that they are artefacts of the measurements. They are real and we have to look for a credible explanation," says Paolo Natoli of the University of Ferrara, Italy. "Imagine investigating the foundations of a house and finding that parts of them are weak. You might not know whether the weaknesses will eventually topple the house, but you'd probably start looking for ways to reinforce it pretty quickly all the same," adds François Bouchet of the Institut d'Astrophysique de Paris. "Our ultimate goal would be to construct a new model that predicts the anomalies and links them together. But these are early days; so far, we don't know whether this is possible and what type of new physics might be needed. And that's exciting," says Professor Efstathiou. "With the most accurate and detailed maps of the microwave sky ever made, Planck is painting a new picture of the Universe that is pushing us to the limits of understanding current cosmological theories," says Jan Tauber, ESA's Planck Project Scientist. "We see an almost perfect fit to the standard model of cosmology, but with intriguing features that force us to rethink some of our basic assumptions. "This is the beginning of a new journey and we expect that our continued analysis of Planck data will help shed light on this conundrum." OK, so who wrote that misleading headline? "An almost perfect universe" doesn't make sense, given the word 'perfect' only shows up in the body of the essay here: "an almost perfect fit to the standard model of cosmology". One does not ascribe universal perfection to the universe just because data fits with a previously conceived label. It's like saying a Snickers bar is perfect because we've detected the presence of chocolate and peanuts; thus agreeing with the label. Funny. I write a weekly newspaper column and am constantly bitching about the headlines ("heds") which are often antithetical to the thrust of the piece but, somehow, consistent with what the editor thinks will snag attention. Most often though they simply indicate that my piece wasn't really read, just scanned, by a very busy person. Not a good explanation, but probably accurate. What exactly do you find misleading about it? The variations in tmperature are extremely small (i.e. you have nearly a perfectly uniform temperature all over the sky - which makes for a nearly perfectly uniform universe). Seems rather fitting - and straight forward - to me. Interesting. Can't wait to see how this affects various theories. Perhaps the way the inflationary period ended has something to do with the anomalies (?). OT/ The pattern recognition part of my brain desperately wants that image to look like a map of the continents of Earth. Why is the universe 'perfect'? Because some giant apes with swollen brain cases orbiting an insignificant mudball in an easily-forgotten arm of a backwater galaxy had a theory, then managed to finagle data that nearly matched their model? That's all there is to it? Perfection, as stated in the essay, simply meant closely matching model and data. Perfection of the entire *universe* *might* need more proof than that, no? "The findings released Thursday bolster a key theory called inflation, which says the universe burst from subatomic size to its now-observable expanse in a fraction of a second. 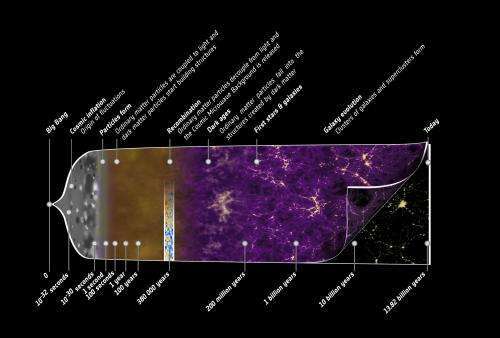 The Big Bang is the most comprehensive theory of the universe's beginning. It says the visible portion of the universe was smaller than an atom when, in a split second, it exploded, cooled and expanded rapidly, much faster than the speed of light." Am I correct that this is rubbish; if not, can someone explain how this can be correct. Because some giant apes with swollen brain cases orbiting an insignificant mudball in an easily-forgotten arm of a backwater galaxy had a theory, then managed to finagle data that nearly matched their model? That's all there is to it? Perfection, as stated in the essay, simply meant closely matching model and data. I'm not seeing where you read that the article states that. It sees a nearly perfect (uniform) universe from the data AND (as a side note) a good match with current theory. But the match with the theory is not why the word 'perfect' is used in the heading. Misleading is all. The headline implies that we've suddenly discovered that the universe is 'perfect'; carefully reading the article says no such thing. Face it, the headline doesn't match the article. And tell me, if you were a sentient living near the center of a galaxy that's being devoured by a super-massive black hole, would you think 'Perfect!'? Out here in bleaksville, we're like the '50's couple living on a cul-de-sac with a new Ford in the driveway. Relatively speaking, that might be perfection. Move 70 years either direction, or a continent away, that'd be but a dream-state. any hints about large structures from an earlier universe as proposed e.g. by Penrose in his latest booK? Wow, that article got it wrong. Inflation says that the universe did expand at a rate much faster than the speed of light. But not to it's present observable size. That took 13.8 billion years or so. It didn't explode either. Expand is a better word. Weird they use both. The universe expanded, and as it did, it cooled. but it has taken, again, about 13.8 billion years to cool to today's temperature. I think you're confusing the expansion taking place "in space" instead of it being an expansion "of space". In space, relative to any position, nothing can accelerate beyond the speed of light, but this is space itself that expanded so there is nothing to be relative to. Every point we can conceive of in our three dimensional universe was in a singularity before the expansion. That includes matter, dark matter, space, time, and everything else out to infinity. Wrapping your head around this is not easy. All experience where spacetime already exists naturally leads one to assume that an area has to already exist to be able to be filled. The headline implies that we've suddenly discovered that the universe is 'perfect'; carefully reading the article says no such thing. (note the word 'tiny'). This is something that was known to anyone who has ever read about the CMBR - andthe study confirmed it. And it is to the interested layman (not the COMPLETE layman) that the article is aimed at. And tell me, if you were a sentient living near the center of a galaxy that's being devoured by a super-massive black hole, would you think 'Perfect!'? Out here in bleaksville, we're like the '50's couple living on a cul-de-sac with a new Ford in the driveway. Relatively speaking, that might be perfection. What are you babbeling about? That you don't like the shade of color of your neighbor's house is supposed to be proof that the universe isn't nearly uniform? If you're construeing that they are talking about absolute perfection (which is just some hogwash philosophical ideal) then you're on the wrong site. These are scientific articles. Written by scientists for scientists. You shoudl therefore try to read them with a scientific mindset. If you try anything else (like reading it with a literary, philosophical or religious mindset) then you shouldn't be surprised that you will be confused. But that confusion is all of your own making. Is it rubbish,maybe? But that is what the standard model of the Big Bang claims happened. Quote from article: "We see an almost perfect fit to the standard model of cosmology, but with intriguing features that force us to rethink some of our basic assumptions." Somehow the two parts of that statement seem to contradict each other. The Huge Bang Fantasy is a consequence of the logically ill-equiped struggling to make sense of the universe without having sufficient technical tools or imagination. Instead, they use the seemingly reliable tools at their disposal, namely math. It is a math fantasy. The struggle becomes to fit the data to the fantasy, as we see in the conclusions reached here. If the fantasy were to die, confusion would reign. And the rational mind hates confusion, and will rather defend the fantasy to the end. The anomaly just "happens" to be centered on the Earth, just like the galactic rotation chirality anomaly just "happens" to be centered on the Earth. Can any physicist off ANY explanation for that, besides some absurd "it's a one a jigazillion chance that just happened, and we just happen to be here to observe it"? It's like two sides to a cosmic coin, and we are on a plane bisecting the faces so that we can always see both results are opposite sides of the same entity. The fact one side of the universe has a different temperature suggests an asymetric origin: the hotter side is closer to a point of origin, or an energy source, possibly. You are correct Tuxford, I'd give you a 5 but physorg took away my ability to rate posting and articles a long time ago. And lousy math at that. They claim "space itself" is expanding, yet assume a constant speed of light, against which it can be measured. If two points x lightyears apart were to grow to 2x lightyears apart, that is not "expanding space," but increasing distance. Those "fluctuations" in the cmbr are just shadows of ever more distant galaxies, that have been redshifted off the visible spectrum. They are the solution to Olber's paradox. Eventually they are going back to the drawing board on this, but don't hold your breath. Too many careers invested in this nonsense. The Big Bang is the most comprehensive theory of the universe's beginning. It says the visible portion of the universe was smaller than an atom when, in a split second, it exploded, cooled and expanded rapidly, much faster than the speed of light." Am I correct that this is rubbish; if not, can someone explain how this can be correct. Easily, it fits the math, which is fitted to this model. After all, the epicycle model of Solar system worked well from formal math perspective before four hundred years. It just couldn't work from intuitive physical perspective. Perfection: - When a perfect universe almost matches an imperfect model. Does the increased amount of mass and reduced dark energy move the transition from a decelerating to an accelerating universe to a more recent time? Perhaps even to the present time? 1. Is the "artifact" that the alpha constant changes from one hemisphere to the other no longer considered an artifact or has it been disproved? 2. If the change in alpha is real, how does it correspond to the change in temperature from one hemisphere to the other? 3. Is the change in temperature from one hemisphere to the other a smooth transition or does it suddenly appear? If the change in temperature is smooth across the universe, this disproves the typical expanding universe and shows there is a start point. This makes the Higgs finding in which space is meta stable incredibly important as the universe could be bubbling out of the unstable previous vacuum. Space isn't expanding, the meta stable vacuume could be expanding into space that already exists. You are probably not correct, and no one can explain why. The explanation that you think is rubbish simply fits the observations. On what basis do you object? Do you have any special knowledge of the nature of the universe when it was only a tiny fraction of a second "old"? Time isn't what you think it is. It is astonishing how anti-science global warming denialists like antigorical are. How do they manage to feed themselves? I was summing up the article's use of the word - perfect. Yet, you jumped to the conclusion that I am anti-science. Vendicar, you are truly an ignoramus. The perceived expansion is based on four observations, the three dimensions of space and the fourth dimension of time. Our Universe exists in three dimensional Space and the Fourth dimension of time. Space-time In physics, is a mathematical model that combines space and time into a single continuum. Time starts with the big bang, the measured expansion is based on time distance light travels in one year,. Time is effected by velocity and the perspective of the observer. Time dilation has been proven to exist. From the perspective of a stationary observer a clock traveling at light speed slows down, from the perspective of an observer moving at light speed a stationary clock speeds up. Planck units used to measure the expansion were first proposed by Max Plank in the 19th century, before Einsteins theory of relativity, and the introduction of the space time continuum and time dilation were ever thought of.. They were proposed to be static. Einstein showed that time is not static and dependent on velocity and the perspective of the observer. "The data also offered striking support for the notion of inflation, which has been the backbone of Big Bang theorizing for 30 years. Under the influence of a mysterious force field during the first trillionth of a fraction of a second, what would become the observable universe ballooned by 100 trillion trillion times in size from a subatomic pinprick to a grapefruit in less than a violent eye-blink, so the story first enunciated by Alan Guth of M.I.T. goes. Submicroscopic quantum fluctuations in this force field are what would produce the hot spots in the cosmic microwaves, which in turn would grow into galaxies. According to Planck's measurements, those fluctuations fit the predictions of the simplest model of inflation, invented by Andrei Linde of Stanford, to a T.
Cosmologists still do not know what might have caused inflation, but the recent discovery of the Higgs boson has provided evidence that the kinds of fields that can provoke such behavior really exist." "According to Planck's measurements, those fluctuations fit the predictions of the simplest model of inflation, invented by Andrei Linde of Stanford, to a T."
Take anything in the general press with a pinch of salt. The results confirm a running spectral index at the level of six sigma, a better detection than the standard five sigma level that led to the publication of the discovery of the Higgs boson. That isn't a new finding but the confidence level is much higher than before. Why wouldn't it show normal statistical variation? How does he explain its black body spectrum? Distributed sources should be far from that. The results confirm a running spectral index at the level of six sigma, a better detection than the standard five sigma level that led to the publication of the discovery of the Higgs boson. Didn't the OPERA experiment claiming faster than light Neutrinos have a rating of six sigma? What ever happened to those guys? No, they found measurement anomalies and after reviewing the data sets found that the faster than c was in fact false. Both electrons and neutrinos can get going very fast indeed, only very slightly slower than c.
Yes, it is the plug in the drain. It has been removed. I'm glad people are aware that the Big Bang is a deprecated model, and has been replaced for sometime, by inflationary theory. So ppl you need to be more accurate, and stop referring to big bang theory, when it is now Inflationary theory!!!! Secondly, if space expands, then surely the newly created space must be back filled with Quantum foam. ie the particles which pop in and out of existence. Does space always have the same vacuum density, even when it expands? If so, then perhaps the universe is being pumped with vacuum energy from an external soure, and due to the "need" of constant vacuum density, then space expands to accomodate this. Just an idea, but if vacuum densisty is constant, and yet we are expanding, then something is filling the void with virtual particles to maintain density. ie, some external energy source!!!! At first glance, it would appear Energy is being added to the Universe. Have I got this all wrong??? Discuss the above vacuum density in an expanding universe. There is no outside to everything. It appears that the properties of space haven't hanged since the early seconds of the Big Bang. at least according to measurements of the fine structure constant. Big Bang is a popular name for LCDM model, which contains inflationary theory as its integral part. So ppl you need to be more accurate, and stop referring to big bang theory, when it is now Inflationary theory!!!! Inflation only affects the rate of change of scale factor in the Friedmann Equations which are the defining element of the big bang. Secondly, if space expands, then surely the newly created space must be back filled with Quantum foam. ie the particles which pop in and out of existence. Does space always have the same vacuum density, even when it expands? Yes. Quantum fluctuations (a.k.a.virtual particles) seem to be an attribute of the vacuum so more vacuum means more room for particles. That's why the equation of state is w = -1 which means the pressure is -1 times the energy density. If so, then perhaps the universe is being pumped with vacuum energy from an external source, .. Expanding against negative pressure does negative work which added to the added energy results in no change, expansion due to dark energy actually conserves energy! The video suggests that Infl. theory (Prof. G. Efstathiou)is being challenged. BUT, the Profs. 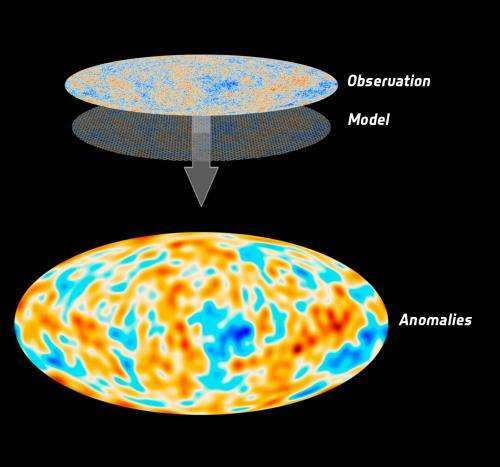 in the video also say the CMB observed doesn't quite 'fit'. My overall impression of the video is that BB theory is still very much alive and not yet replaced by Infl but that perhaps both theories might combine in some way. The comments refer to the confirmation of a runing spectral index. It means there is a very small departure from linearity of the Harrison-Zeldovich primordial power spectrum of the perturbations left by inflation. It's a very slight change to the shape of the curve created by inflation, but inflation remains an integral part of the concordance model. To see how subtle the changes are that are causing the interest, look at the graph on the last page. Running of the spectral index makes the difference between the solid and dotted yellow lines. There is absolutely no proof that gravity, defined as the attractive force between two masses, actually exists. There are simple experiments which prove that F=GmM/rr is incorrect. Yet all of the conjecture in this article is based on the existence of gravity. There is absolutely no proof that gravity, defined as the attractive force between two masses, actually exists. There are simple experiments which prove that F=GmM/rr is incorrect. Gravity hasn't been considered to be an attractive force since 1915 and the Newtonian equation was known to be only a good approximation before that from the precession of Mercury's orbit. Yet all of the conjecture in this article is based on the existence of gravity. Something keeps your feet pressed to the surface of the planet so some phenomenon undoubtedly exists. You just need to update your knowledge of physics by a century or so. 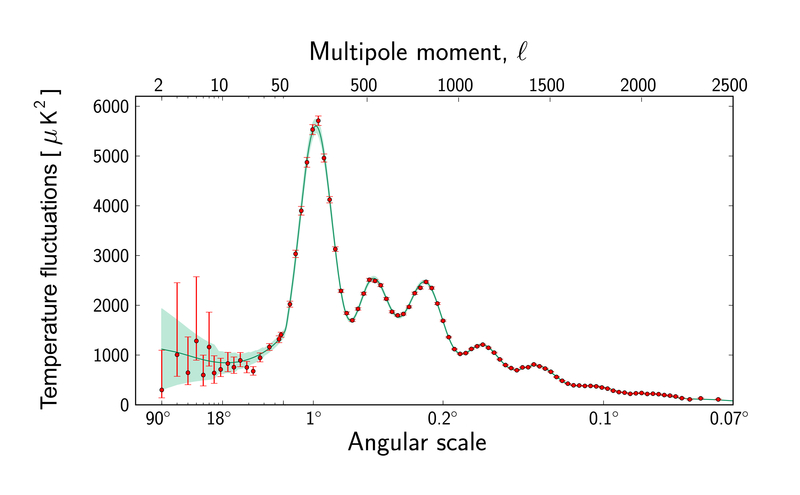 New data reveal, that the Universe is lopsided on a vast scale. What can this mean? It just means the AWT - well, again... In foam the energy propagates in many directions, including the direction toward the source. So if you shine the light into the foam, whole the volume of foam will shine, not just the place of light target. In AWT the foamy space-time can be modeled with water surface. At the water surface most of energy spreads in transverse waves in similar way, like the light waves in vacuum - i.e. in pretty deterministic way. But at distance all these waves will get scattered into underwater, where the energy spreads in form of much faster longitudinal waves. After then there is non-zero possibility, that the portion of energy sent along water surface in form of transverse waves will arrive back after while in form of longitudinal waves. The lopsiding of Universe is already known as so called the dark flow effect and the Planck spaceprobe just confirmed it with Doppler analysis of CMBR. Note that the cyclic aspect of observable universe was somehow guessed in various esoteric theories like the Ouroboros model of universe. And/or in more modern theories, which assign the Universe the Klein bottle or Mobius strip topology. And because the geometry of Universe is similar to black hole and they're similar to elementary particles, the same swirling motion and topology can be expected both at the case of giant black holes, both at the case of elementary particles, like the electron. The observable universe is somewhat similar to interior of Sun with its convective cells, but in AWT it's merely a geometric effect. What can this mean? It just means the AWT - well, again... In foam the energy propagates in many directions, including the direction toward the source. So if you shine the light into the foam, whole the volume of foam will shine, not just the place of light target. No, in your analogy, it means if you shine the same light in the northern hemisphere, it would shine slightly brighter than the same beam shone in the southern hemisphere. Looking at the map of the anomaly however, it bears more resemblance to the extended cluster of quasars found recently than an overall hemispherical difference. 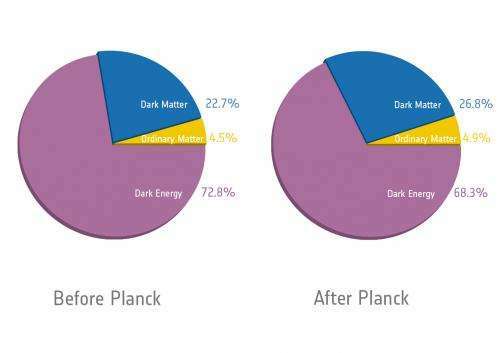 Planck does seem to confirm the 'dark flow' anomaly but that is a separate effect from the asymmetry, there are two distinct anomalies. At the water surface most of energy spreads in transverse waves.. Learn some basics, water CANNOT propagate either transverse body waves or transverse horizontal waves, it has NO shear strength. You have had this pointed out to you dozens of times now, there is no excuse for continuing to post disinformation which you know is a lie. Nope, it means that the interior of observable Universe appears like the giant cluster of slowly swirling bubbles of roughly dodecahedron topology. BTW such a geometry is very common for elementary particles (we shouldn't forget the AdS/CFT duality). But it's heavily violated with another large-scale structures, so that neither hyperbolic, neither dodecahedron, neither black hole or Klein bottle topologies are exact descriptions of essentially random universe at large scales. It's a mixture of all of them. Which is why I don't talk about Doppler shift in connection to dark flow or polarization of CMBR, as you probably didn't realize. All these anomalies are mutually connected each other in AWT model, if you superpose the hyperbolic geometry of universe over the dodecahedron geometry. Water mediates both surface waves, both underwater sound waves. Of course, the longitudinal wave effects are enhanced in shallow water, but the Universe has no apparent "bottom", so such an analogy cannot be used. Which is why I don't talk about Doppler shift in connection to dark flow or polarization of CMBR, as you probably didn't realize. You constantly witter on about things you don't understand, Doppler included. The region indicates a variation in measured temperature which may correlate with a difference in density through gravitational redshift. There is no connection to Doppler at all. Which is why I don't talk about Doppler shift in connection to dark flow or polarization of CMBR, as you probably didn't realize. Should I repeat it once again? Nope, it means that the interior of observable Universe appears like like the giant cluster of slowly swirling bubbles of roughly dodecahedron topology. ... But it's heavily violated with another large-scale structures, .. Complete rubbish, you need to read the papers before trying to post on this stuff. No need, just go to the second page of comments on this article and search for "Doppler", you used the term 6 times (depending on which comments slip off the page) only two of which are valid. You continually use the term when describing gravitational shift, about the right ratio for random guessing. Which papers? Like this one and one? The foam bubbles come with dodecahedral geometry. ..search for "Doppler", you used the term 6 times.. The CMBR anomalies appear in the way, the CMBR anisotropy represents a "sink", into which the nearby galaxies are sucked slowly. But this flow can be observed only at the boundaries of sink, above its center the galaxies are heading toward us, so that their lateral motion cannot be detected. I'll go ya one better,,,, Last week "Doppler" and "AWT" and "vacuum foam" were combined in a comment to an article about biological evolution. ("electron duality", "longitudinal waves", "aether", "dense vacuum" were introduced in a subsequent comment in the same thread.) Expanding the science of biology. This article by MIT professor Daniel Kleppner shows how an exercise in statistical analysis, such as the observations above, can lead to erroneous and inaccurate conclusions. the CMBR anisotropy represents a "sink", into which the nearby galaxies are sucked slowly. Rubbish, it is a near gaussian variation over the whole sky relative to the mean and represents the small differences in gravitational redshift from statistical fluctuations in density. If you meant the dipole anisotropy, that is a caused by the proper motion of the Solar System relative to the mean frame of the plasma. That was 20 years ago and discussed the problems with COBE, the first generation attempt. It did a great job considering, but the problems he notes were discovered on that mission were the basis of the second generation WMAP mission, and Planck is now third generation. 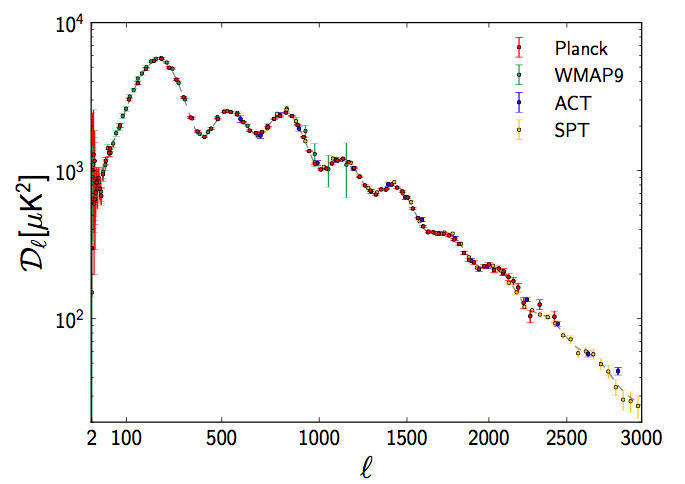 Statistical analysis is critically important to such difficult measurements, that why WMAP took 9 years to complete that work, and I wouldn't be surprised to see Planck analyses improving for another decade too. The fact that WMAP, SPT, WiggleZ, BOSS and so on all come out with incredibly close results for the base parameters using completely different techniques looking at very different physical aspects is what gives us confidence that they are representative. You're explaining the phenomena with its interpretation...;-) This is logical fallacy. In addition, this interpretation doesn't explain the lopside character of CMBR noise - whereas the AWT interpretation does. You're explaining the phenomena with its interpretation...;-) This is logical fallacy. That is the dipole anisotropy and is an exact match for the Doppler effect expected if the Solar System is moving from the centre of the red dot (top right) towards the centre of the blue (bottom left). The effect in between is exactly proportional to the cosine of the angle. It is the long, vague red and blue streaks either side of the white line that are unexpected. Note they are nothing like the Doppler-like pattern of the previous image, that was my point. The "dark flow" is the small blue dot highlighted by the white ellipse in the bottom right corner. The Big Bang prediction is the dotted grey line, mostly hidden by the actuals. Again, the "anomalies" are in the noise on the far left where l<40. In your opinion, does Planck 'pattern' effectively give us overarching (or "preferred") FRAME OF REFERENCE for determining/distinguishing/describing etc all motions such that "relative-to-other body' view (as in SR) may become moot if we can discern 'absolute' motion wrt Planck pattern like you mention for Solar System Motion for eg? .. does Planck 'pattern' effectively give us overarching (or "preferred") FRAME OF REFERENCE .. such that "relative-to-other body' view (as in SR) may become moot if we can discern 'absolute' motion wrt Planck pattern like you mention for Solar System Motion for eg? Yes and no, it has always been known that the Friedmann Equations define a special type of motion which identifies a symmetry. Cosmology deals with hypothetical comoving objects and proper motion relative to them. Comoving galaxies are defined as seeing no dipole component in the CMBR but the distance between two such galaxies one megaparsec apart would be increasing at ~70km/s, the present value of the Hubble Parameter. That doesn't form a "frame" in the SR sense because it remains impossible to apply a cartesian set of coordinates over the whole universe. The plasma that emitted the CMBR was just a cloud of ionised gas and all of the laws of physics still apply regardless of your motion relative to it. Universe, perfect? Yes! ... and as perfect as it will ever get. ValeriT: "Easily, it fits the math, which is fitted to this model. ..." But the math and the models were constructed and designed to fit the accepted/acceptable facts, not the more complex, less understood reality. There is still plenty of "devil in the details". Ignore Maxwell's equations at your peril, there is "dark energy" to be accounted for, and it might turn out to be entirely "electric". Well I must say I have enjoyed the civilised discussion going on in this thread. You have impressed me fleetfoot and Valeria. When Val isn't trolling, it's possible to have a sensible conversation. Cosmology is an area where new technology is moving the boundaries forward at an amazing pace and what we are uncovering is full of surprises, the cranks don't know what they're missing.